Hans Brase kept an even keel as he looked forward to making his first start for the Princeton University men’s basketball team when it hosted Rider last Thursday. “It was just a normal game; I just happened to be out there at the tip,” said Brase, a 6’8, 231-pound freshman from Clover, S.C., who starred at the Hill School (Pa.). Brase proceeded to show a lot of game, scoring a team-high 17 points as the Tigers pulled away to a 62-45 victory before 1,570 at Jadwin Gym. Establishing an immediate connection with Tiger senior star Ian Hummer helped Brase knife through the Rider defense. “When I got on the block, he would cut and there were wide open lanes,” said Brase, reflecting on his work with Hummer. It was fun for Princeton head coach Mitch Henderson to see Brase make an immediate impact. “Hans is just a player; he is capable of doing a lot of things,” said Henderson, whose team snapped a two-game losing streak and improved to 4-6 with the victory. 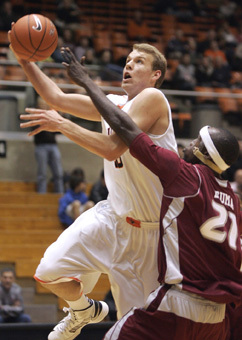 In addition to scoring, Brase helped Princeton handle the Broncs’ defensive pressure. “He sees and he is another person who can open the floor,” added Henderson, whose team wraps up the 2012 portion of its schedule with a game at Akron on December 30. Another key for Princeton was being aggressive in driving to the basket. “I think they were just looking for each other better,” said Henderson, who got 15 points apiece from Hummer and Koon. Brase, for his part, is looking to continue to make an impact inside for the Tigers.